I liked Through The Ever Night! Not as much as Under The Never Sky, but it was still a great book to read! So, the thing with Through The Ever Night is that I was in this weird funk when I first read it, and while I was reading words, they didn’t actually stick or sink in, and I couldn’t remember anything that happened, even though I had just read it. So I knew a re-read was in order if I wanted to properly talk about this book. Through The Ever Night did start off slow for me and it was hard to get into at first. It does pick up where the first book left off, and I liked seeing what was going on with Aria and Perry after Under The Never Sky ended.Still, there’s a lot of action once things get going, and I liked getting a better look at Perry’s group. I did like how he realized that things weren’t as easy as he thought they would be, and that he had to do things his own way. I will say that I’m glad we got to meet Liv (finally!) but I’m really wishing she stood out more to me. Something that happened didn’t have a huge impact on me, and I think a lot of it is because the book focuses on Perry and Aria (and not Roar and Liv), so we don’t get a lot about their relationship, or anything about Liv. I felt like I knew she was there, and was with Roar, but she did seem like a character who was mentioned a handful of times. I do believe there is a novella about Roar and Liv, and I’m not sure the impact of what happens with Liv would have been different had I read the novella. But there is a part of me that wishes it were shown in the actual book, and not the novella. (Assuming that the novella actually would change my mind about it, of course. Because it might not). I did like the connection between Cinder and the Aether and the Still Blue, and I’m really looking forward to seeing how it all comes together! Because I’m not sure how everything is going to happen, and I’m definitely wanting to see how they get to the Still Blue. And if it’s really all that it’s cracked up to be. One random thing that I’m wondering about is Aria’s dad. I doubt we’ll ever learn more about him, but considering she’s part “Dweller” and part “Mole,” I’m curious to see if more will come from it, or if it’s just there so she can fit in everywhere, and be all, “hey, I’m one of you…sort of.” I get why we learn it, but considering that nothing’s really been done with it yet, it still feels like it’s there just to be there. I’m glad I gave Through The Ever Night another read before talking about it! It did start off slow, and there are a couple things I didn’t like or am wondering about, but overall, I’m glad we got to see both Perry and Aria after the events of the first book. Especially with Perry, because we got to see him as Blood Leader and we got to spend so much more time in his world. 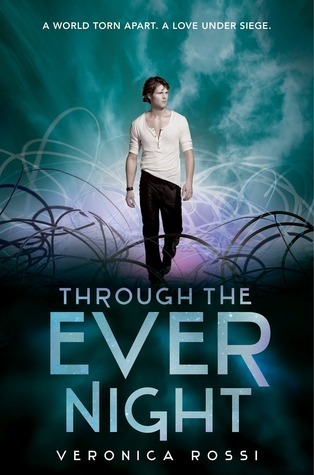 Through The Ever Night gets 4 stars.